I have what some people may consider an obsession with salt. Frankly, if my food doesn't have a ton of salt in it, I don't want to eat it. (And yes, I know how bad it is for me.) 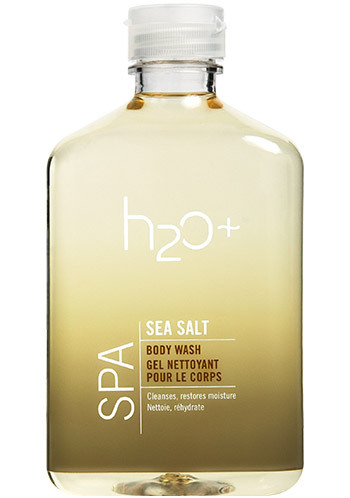 So I think you can imagine how excited I was to try out H20+ Spa Sea Salt Body Wash. In addition, European sea salts invigorate the skin. The formula lathers up quite nicely, and once rubbed into the skin, it almost feels like you've used mint or menthol -- it's shockingly cooling! I was actually surprised to discover that this body wash gives off a sweet meets salty aroma. I was expecting it to smell, well, salty ... and it does, but thanks to the notes of green tea, it's tinged with a touch of sweetness that makes me think of the ocean air. My skin is definitely softer and smoother since I started using this body wash ... which, especially with the dehydration I've suffered all winter long, is a welcome treat. Pass the salt, indeed. H20+ Spa Sea Salt Body Wash retails for $18 at h20plus.com.